It’s the “Stash Busters” shawl class. Bring your stash, pick up some extra colors at the shop, share what you have if you want to, and prepare to be inspired. Instructor Lyn Brandmeir will show us how, in just two sessions, to make a shawl. You’ll learn how to cast on, bind off, and fringe. No pattern required, but you’ll need at least a #15 32-inch circular needle. Cost for both sessions is only $25 and space is limited, so sign up now. Click here for a full class schedule and registration information. Join us on Facebook. There’s a picture of a “stash buster” shawl on our wall. 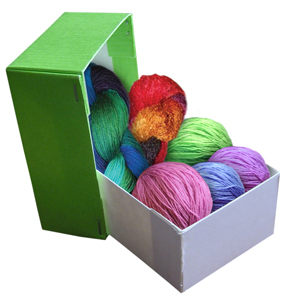 This entry was posted in classes, Kingston Springs, Uncategorized, yarn, yarn shop and tagged classes, Ewe and Company, hand-painted yarn, Kingston Springs, knit shop, knitting bags, knitting technique, yarn shop. Bookmark the permalink.